Do you crave something like mac and cheese only a little meatier? This Sausage Noodle Casserole is just the ticket. 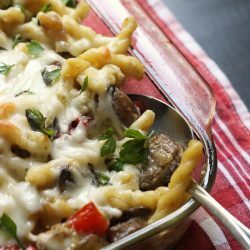 Glorified mac and cheese, full of comfort and love, dotted with spicy bits of sausage and juicy peppers. Preheat the oven to 350 degrees. Grease a 9x13-inch baking pan with nonstick cooking spray. In a large pot of boiling, salted water, cook the pasta until al dente. Rinse and drain. In a large skillet, cook the sausage links until cooked through and lightly browned. Remove them from the pan. Once they are cool enough to handle, slice them thinly. Saute the pepper, onion, mushrooms, and garlic in the drippings. Season to taste with salt and pepper. In a large bowl, combine the soup and pesto. Whisk to combine. Stir in the cooked pasta, sausages, and vegetables as well as the sundried tomatoes and 2 cups of the cheese. Spoon this mixture into the prepared baking dish. Sprinkle the remaining cheese over the top.